PRECISION Air & Liquid Solutions offer you SOLUTIONS for the industrial/commercial and/or governmental markets on air handling/filtration/ventilation & flow monitoring (INCLUDING OUR LATEST OFFERING – AIR FLOW STUDIES TO IMPROVE SYSTEM PERFORMANCE) in Louisiana, in Mississippi from Jackson MS South and including the Gulf of Mexico! on customers compressors, turbines and engine systems. 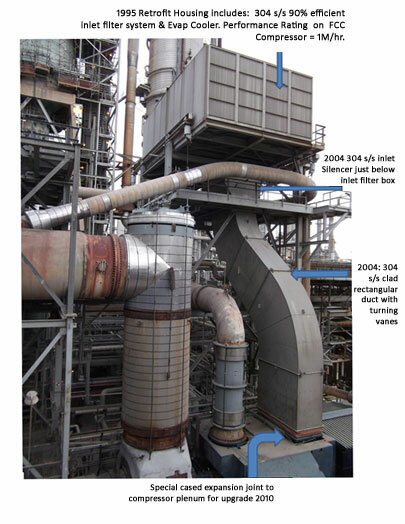 Upgrades/ “retrofits” to existing systems – ductwork, silencers, housings, inlet & exhaust systems, dust collection, air scrubbing, mist elimination. Design/build assistance – PE flow diagrams to improve system performance. Inlet air & exhaust systems including silencing, proper filter selections including HEPA filtration, inlet changes and ductwork with turning vanes, weather protection, cooling/heating � truly CUSTOMIZED solutions on turbo machinery such as gas turbines, compressors, reciprocating engines. Why not try our CamLab today! Let�s see how we can improve your system performance, efficiency, increase horsepower, reducing fouling and cleaning cycles, while decreasing fuel usage and balancing temperatures---RELIABILITY! including filter contracts with stocking options as required! Gas Phase dry bed SAAF scrubbing systems (MCC rooms, turbo machinery, hospitals) – wherever corrosion of electronic or rotating equipment is of concern; “fumes” are in the atmosphere; compromise of artifacts or artwork become an issue. INTRODUCING PRECISION Air & Liquid Solutions air flow studies to improve system performance!! Offering complete exhaust systems on gas turbines/compressors, reciprocating engines, generator packages, etc. INCLUDING BUT NOT LIMITED TO “SCR” “Selective Control Reduction” catalyst systems per EPA/DEQ continued diligence on emissions. Let us help you with your troubled applications. Replace your existing belt driven fans with arrangement 4 direct driven fans. Which will greatly reduce your maintenance and vibration issues. galvanized as well as stainless construction! of full pipe or open channel! Precision-Air & Liquid Solutions owner, holds FLO-DAR over unique flow application. 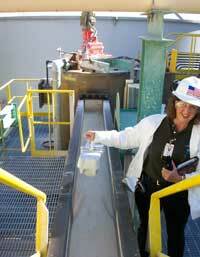 Customer needed accurate flows of chemical thru trough prior to entering a mixing vat (at rear of picture). This meter will be attached above trough and monitor flow without touching the liquid. Continued onsite assistance for outfall verifications on DEQ/EPA reporting – along with calibration, installation and certification certificates. “PALS offer over 30 years of experience in the ventilation, filtration and flow monitoring market – offering complete sales and service, along with design assistance for your industrial or governmental plant needs. Your firm will not only achieve excellent end results with only the highest quality product and service offerings (with low EMR ratings and proven results) – but you will also afford your organization the governmental compliance through utilization of a FARR designated and CCR approved firm as required in today’s competitive marketplace”. Also, when time becomes an issue – we WILL deliver your requirements QUICKLY and with GUARANTEED results."